When it comes to being a video publisher, one thing you would be facing is that you have to create useful and meaningful audio-visual content- content which is not only fun and engaging but also quite informative as well as useful. Content which would make people actually willing to pay for- something which can be easily and effectively distributed which is something entirely two different ballgames especially in the year 2017 and onwards. As per recent market research and its implications, DVDs are losing their significance with DVD sales dropping by 8.2% in the first half of 2014, as per Digital Entertainment Group report. Online video streaming is considered to be the future with a large number of users as well as consumers opting for it as a method of getting and consuming video content due to the obvious convenience factor which is offered by it in comparison with DVDs. Considering this situation, a video publisher is facing two choices: making their products available using a reliable streaming or download service else losing customers along with sales and revenues. Uscreen.tv is a platform which helps the publishers to monetize video content and help them to reach out to people globally. A lot of its customers are the marketers who wish to educate the audience with their educational videos. Educational videos have picked up the pace in the recent times with more people opting out for it in order to gain knowledge. Uscreen is a brand new video streaming service which was launched in the year 2013. 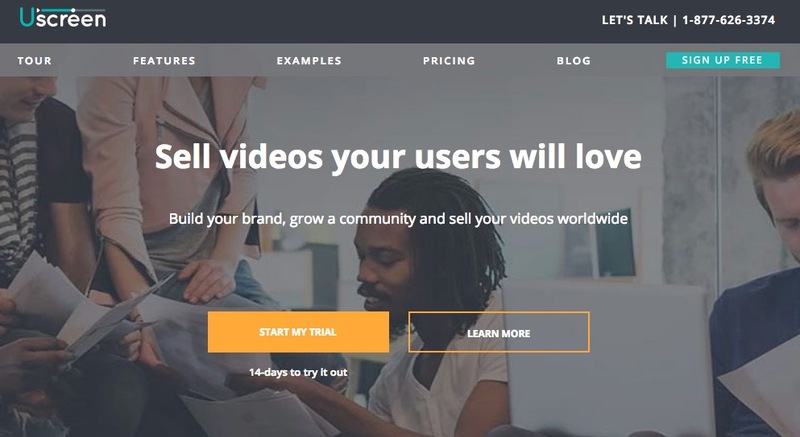 It is an online platform which enables businesses to sell as well as distribute their videos directly to the customers in an easy and simple way. First is Security and DRM offered by Uscreen. Uscreen allows the publishers to sell their videos with confidence without worrying about piracy as all the video on this platform are duly protected with their Digital Rights Management or DRM which is the state of the art technology of intellectual property protection widely used by the publishers, copyright holders along with hardware manufacturers and individuals. And it provides encryption which provides maximum security. Second is the ability to view on any device. The viewers often like to watch the videos on different devices. Uscreen platform provides video available on any device such as desktop, laptops, smartphones, even tablets, and TVs, at any time and anywhere. There is a wide range of devices which are supported by the platform. Thirdly, streaming and downloading which enables the users to either view the video content online by streaming it from Uscreen. They can also download the videos to their devices and then can watch them even when they are offline. Fourthly, it is the Digital forefront. Uscreen offers a customizable storefront where one can showcase his video and then sell them to the customers while all the related e-commerce operations as well as transactions etc. are handled by the platform. It is an elegant online video content storefront which is created with the Uscreen platform which comes with a completely integrated shopping cart along with video library as well as demo links. At last, the individual products or videos can be attractively presented and showcased on the Uscreen to entice the customers. Chapter and Episodes – Uscreen provides the publishers to add a tag to their videos with chapter along with episode markets, just like they can do with a DVD. One can also create links to PDF documents along with the websites from any portion of their videos. The top left link points that are present at the Uscreen interface links to a PDF document while different links situated at the bottom takes you to different episodes of the video. Rent, buy or subscribe – The users are allowed to rent, buy or even subscribe to any of the video displayed on the Uscreen. There is publisher admin area which allows the publishers to set the price of the video as well as manage the subscriptions. Uscreen also provides mobile apps for Android as well as Apple iOS which allows the mobile users to buy as well as view video content with ease on their mobiles. Uscreen video can be created by following a simple process. First, build a video menu and then setup chapters. The publisher can set a price to the video. Then the publisher can start selling it. Uscreen allows the publishers to do all this with a simple, menu-driven method which makes it easier to deliver video content and for the customers to buy and view it using their preferred devices, all online. It allows integration with existing websites. It also allows the integration with Shopify which is one of the most famous e-commerce platforms. It provides direct access to the customers. There are APIs available too. As per Uscreen official sources, the important and major customers are those companies which belong with fitness, educational as well as motivational speaking industries. Some of its major customers include Hoopnotica which is a hula hoop dance instruction company. Another customer is FLX which is flexibility and strength training company. It also has Gin Miller as a customer which is a fitness studio along with workout video company. It has MazzMedia as a client which is a company that offers educational media along with DVDs and form of mediums. All these companies have been able to add a new revenue stream to their business by making their videos available for streaming as well as downloading through Uscreen video distribution platform. Hoopnotica, for example, as recorded as high as 155% increase in their video sales after they signed up with Uscreen. They also claim that after joining Uscreen, 4 out of 5 of their video places comes from streaming as well as downloading. When it comes to business owners, one already knows that he has to know where their current and prospective customers are. For any video content publisher, where the consumers like to stream and download videos, there is a requirement to maintain and grow the sales flow as well revenues. In these terms, Uscreen is a powerful and easy to use online video streaming as well as a distribution platform. Uscreen is one of the best online video distribution service which allows the publishers to display their video content so that the consumers can watch the videos by streaming or downloading the videos. It allows the publishers to monetize the video content. It has many inherent features such as creating chapters and videos like DVDs. It also allows the publishers to avoid piracy. The users can watch the video on various platforms as there is an option provided by Uscreen to view the videos on different devices. It is easy for the publisher to create a video menu, set price, check the preview and start streaming. It allows the videos content to be integrated with existing websites. It can also be integrated with e-commerce platforms such as Spotify. It has better advantages than its competitors. It comes with apps for both Android as well as iOS which allows its users to watch the video on their mobile phones. Another important aspect is that the users are allowed to rent, buy or even subscribe the video content. All in all, Uscreen is a multi-faceted platform which allows seamless video streaming and download service which helps the publishers to increase their sales and revenues.